Warhol For Sale - Misc. 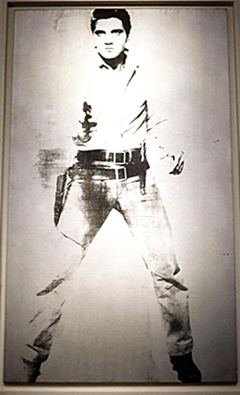 An Andy Warhol painting of Elvis Presley is up for auction with an estimated price tag of around $30 million. "Double Elvis (Ferus Type)" depicts the hip-swiveling musician holding a revolver, as he appeared in the 1960 movie Western "Flaming Star." A ghostly duplicate image hovers in the background. The 1963 black-on-silver portrait is being auctioned by Christie's in New York on May 17, alongside Warhol's "Most Wanted Men No. 11, John Joseph H., Jr." One of a series of mug shot images created by Warhol for the 1964 New York World's Fair, it's also expected to fetch "in the region of $30 million," Christie's says. The portraits are on display at Christie's London showroom from Friday until Tuesday. Christie's chairman Alex Rotter said the paintings of Elvis are "very memorable and early examples of Warhol's profound understanding of fame."